How they feel about hefty taxes on the rich depends on what you call them. Sixty-three percent of Americans believe “upper income people” pay too little in taxes, according to a new survey from Morning Consult. The poll also found that 61 percent of Americans either “strongly” or “somewhat” favor 2020 Democratic presidential candidate Elizabeth Warren’s tax plan, which would levy a new tax on households with a net worth of $50 million or more. The pollster found less enthusiasm for the idea that Democratic Rep. Alexandria Ocasio-Cortez of New York floated recently to tax income that exceeds $10 million a year at a rate of 70 percent — but more on that in a moment. It isn’t shocking that a majority of Americans support higher taxes on the wealthy. 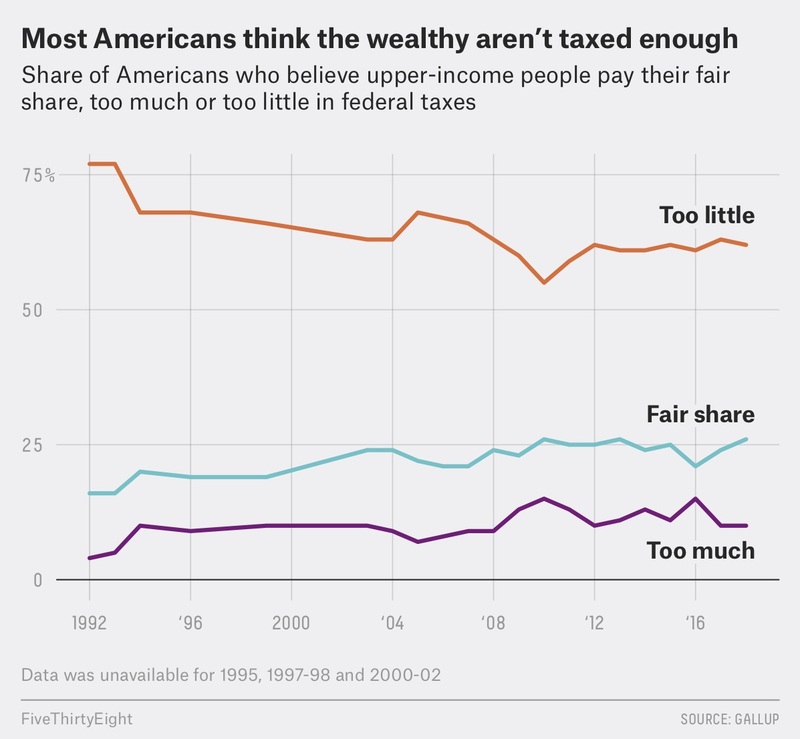 Gallup has routinely found that most Americans think upper-income people pay “too little”1 in federal taxes since it first asked the question in 1992. In April of 2018, that number was 62 percent, according to Gallup — roughly the same as what Morning Consult found. Warren’s tax plan has been described as an “ultramillionaire tax” that aims to make the rich pay taxes on accumulated wealth. It would place a 2 percent tax on households whose net worth exceeds $50 million and then an additional 1 percent (so 3 percent total) on those worth more than $1 billion. The plan has faced some criticism, including claims that it’s unconstitutional. Interestingly, however, the support for the plan appears to be somewhat bipartisan, according to the Morning Consult poll: 74 percent of Democrats and 50 percent of Republicans said they strongly or somewhat favor the proposal. On the other hand, the 70 percent marginal tax rate mentioned by Ocasio-Cortez on income above $10 million did not receive the backing of a majority of respondents in the Morning Consult poll; just 45 percent said they strongly or somewhat favor the proposal. More Democrats than Republicans said they supported it, 60 percent vs. 31 percent. Ocasio-Cortez has said the resulting tax revenue could be used to fund the “Green New Deal,” a massive government investment to eliminate the use of fossil fuels in 12 years. While a top marginal rate of 70 percent would be a major change — the top rate is currently 37 percent on income above about $500,000 — it would be comparable to the top rate at different points in U.S. history. However, even though the public has long thought the rich don’t pay enough in taxes, Americans are comparably cooler toward the concept when it’s framed as income redistribution, which Warren and Ocasio-Cortez have both embraced as a way of combating wealth inequality. For example, in 2016, Gallup found that 61 percent of the public felt that wealthy people didn’t pay enough, but only 52 percent said they believed the government should redistribute wealth through “heavy taxes on the rich.” The difference gets at a common disconnect in how people think of taxation and wealth redistribution — both processes that collect a portion of residents’ income and use it to benefit others — and how different terms can produce seemingly inconsistent answers from poll respondents. So in the forthcoming battle over public opinion, we can expect Warren to talk about taxing the “tippy-top 0.1 percent,” who Americans don’t feel pay enough in taxes, while her critics slam the proposal as wealth redistribution, a concept that’s more divisive. According to a CNN/SSRS survey, 87 percent of Americans want a report that includes the findings from special counsel Robert Mueller’s investigation into Russian meddling in the 2016 election to be made public. Nine percent said the report does not need to be made public. And this desire bridges the partisan divide: 92 percent of Democrats, 88 percent of independents and 80 percent of Republicans said investigators should issue a public report. A poll from CBS News/YouGov found that 76 percent of viewers of the State of the Union approved of President Trump’s speech, compared with just 24 percent who disapproved. But the poll also found that a plurality of viewers (43 percent) identified as Republican (26 percent said they were independent, and 24 percent said they were Democratic). A survey of State of the Union viewers from CNN/SSRS had similar findings: 76 percent of respondents had a “very positive” (59 percent) or “somewhat positive” (17 percent) reaction to Trump’s address. Forty-two percent of the poll’s respondents were Republican, 35 percent were independent and 22 percent were Democratic. Gallup found in a poll conducted before the State of the Union that 60 percent of respondents said they opposed “significantly expanding the construction of walls along the U.S.-Mexico border,” while 40 percent favored it. Meanwhile, 75 percent favored hiring “significantly more” border agents, while 24 percent opposed it. In that same Gallup poll, 81 percent of respondents supported a path to citizenship for undocumented immigrants, while 18 percent opposed it. And 61 percent opposed deporting all undocumented immigrants, while 37 percent supported the idea. A racist photo found on Democratic Virginia Gov. Ralph Northam’s page in his 1984 medical school yearbook has sparked calls for his resignation, and a new Huffington Post/YouGov survey found that 56 percent of Americans say it’s unacceptable for a white person to wear blackface makeup. But the poll did find a stark partisan divide: 78 percent of Democrats said it was unacceptable while 38 percent of Republicans said the same. In addition, 36 percent of Republicans said it was acceptable and 26 percent were unsure, compared to 12 percent of Democrats who found it acceptable and 10 percent who were not certain. Mississippi is one of the three states holding a gubernatorial election in 2019 — along with Kentucky and Louisiana — and a Mason-Dixon Polling survey asked residents about the frontrunners. Jim Hood, Mississippi’s Democratic attorney general, was in the lead, 44 percent to 42 percent over Tate Reeves, the Republican lieutenant governor. The poll also found Hood up 40 percent to 38 percent over Reeves in a possible three-person race with an independent candidate. This matters because the state constitution requires the winner to garner a majority of the vote (in addition to carrying a majority of state House districts) to be seated. Otherwise, the state House — currently controlled 73 to 46 by the GOP — picks the winner. 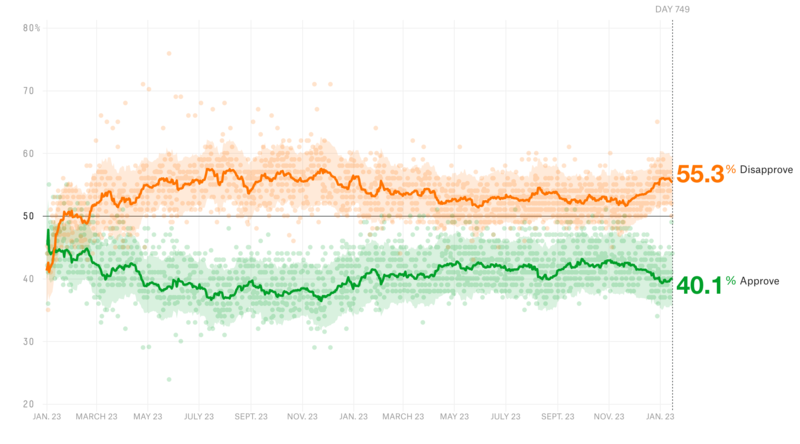 According to FiveThirtyEight’s presidential approval tracker, 40.1 percent of Americans approve of the job Trump is doing as president, while 55.3 percent disapprove (for a net approval rating of -15.2 points). That’s an improvement from a week ago, when 39.5 percent of Americans approved of the president and 55.9 percent disapproved (a net approval rating of -16.4 points). Trump’s net approval rating has dropped significantly from a month ago, when it was -12.3 (41.3 percent approved, 53.6 percent disapproved).